The parasympathetic nervous system (PNS) controls homeostasis and the body at rest and is responsible for the body's "rest and digest" function. The sympathetic nervous system (SNS) controls the body's responses to a perceived threat and is responsible for the "fight or flight" response. The PNS and SNS are part of the autonomic nervous system (ANS), which is responsible for the involuntary functions of the human body. The parasympathetic nervous system is one of the two main divisions of the autonomic nervous system (ANS). Its general function is to control homeostasis and the body's rest-and-digest response. The sympathetic nervous system (SNS) is one of two main divisions of the autonomic nervous system (ANS). Its general action is to mobilize the body's fight-or-flight response. Control the body's response while at rest. Control the body's response during perceived threat. Counterbalance; restores body to state of calm. Body speeds up, tenses up, becomes more alert. Functions not critical to survival shut down. 2 What is the parasympathetic nervous system? 3 What is the sympathetic nervous system? The autonomic nervous system (ANS) regulates visceral functions, i.e. functions of the internal organs such as the heart, stomach and intestines. The ANS is part of the peripheral nervous system and also has control over some muscles within the body. The functions of the ANS are involuntary and reflexive, e.g. the beating of the heart, expansion or contraction of blood vessels or pupils, etc. — which is why we are seldom conscious of it. The parasympathetic and sympathetic nervous systems, along with the enteric nervous system make up the ANS. 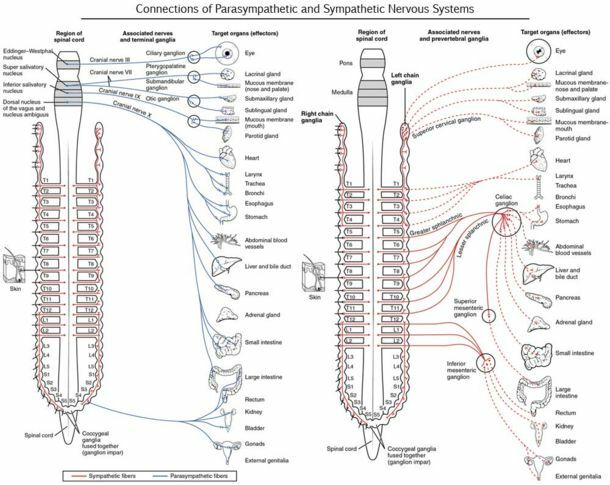 The parasympathetic nervous system is part of the autonomic nervous system. It originates in the spinal cord and the medulla and controls homeostasis, or the maintenance of the body's systems. The parasympathetic nervous system controls the "rest and digest" functions of the body. The sympathetic nervous system, also part of the autonomic nervous system, originates in the spinal cord; specifically in the thoracic and lumbar regions. It controls the body's "fight or flight" responses, or how the body reacts to perceived danger. A diagram of parasympathetic and sympathetic effects. Click to enlarge. The parasympathetic nervous system is a slower system and moves along longer pathways. Preganglionic fibers from the medulla or spinal cord project ganglia close to the target organ. They create a synapse, which eventually creates the desired response. The sympathetic nervous system is a faster system as it moves along very short neurons. When the system is activated, it activates the adrenal medulla to release hormones and chemical receptors into the bloodstreams. The target glands and muscles get activated. Once the perceived danger is gone, the parasympathetic nervous system takes over to counterbalance the effects of the sympathetic nervous system's responses.